Role: UX Researcher & Designer within a four person UX team responsible for meeting the goals of the project and communicating the methods used to do so. Timeline: 9 Days *Note: For the purposes of this in-class project some constraints and desired features were provided. Challenge: Under Armour is transitioning towards performance tracking, with their sights set on fabrics that display stats themselves. Their latest efforts towards this goal include the launch of Armour39, a performance monitor, to acquisition of mapmyfitness, the maker of several tracking apps. Under Armour needs to tackle features that aggregate health data, a new way to incentivize consumers to improve their health, and to help users with various methods of fitness tracking to make sense of it all and pull the data together. Outcome: Our team created a solution that met all the needs of where Under Armour was seeking to go. I designed and deployed a day one survey instrument whose analyzed findings guided our design on a mobile app, a web based portal, and other products, as well as the feature sets of these solutions. Additionally I conducted a competitive analysis and developed personas to ensure careful consideration of the use cases and as a tool for communicating our solutions. I also utilized Xcode 6 (Swift) to design an alpha state functioning iOS prototype in iOS 8. I deployed a day one survey instrument to collect data. Our primary goals were i.) to learn about people's health and fitness goals and ii.) 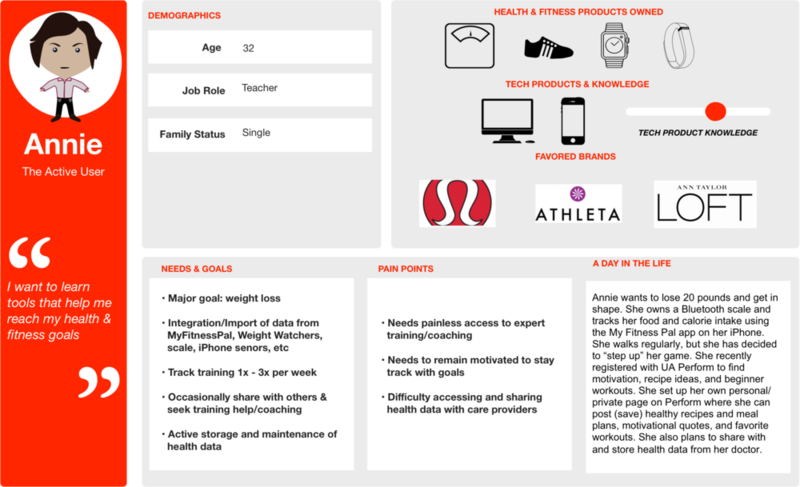 to learn about user needs surrounding tracking and sharing health and fitness information. Our team conducted a competitive analysis which yielded the recent Under Armour acquisition of the "Map My" and "MyFitnessPal" suites of apps. The UA (Under Armour) brand now wields a community of over 120 million people, one of only 20 brands with a user base of over 100 million people. Individually, I compiled a list of present day device/account solutions that allowed easy connection to the UA Record solution. Additionally, research went into determining how many products/brands would allow for integration without breaking/pushing intending use cases of the manufacturer. These considerations lead our team to the strategic understanding that a "device agnostic" portal for data collection, storing, and sharing is a key element. 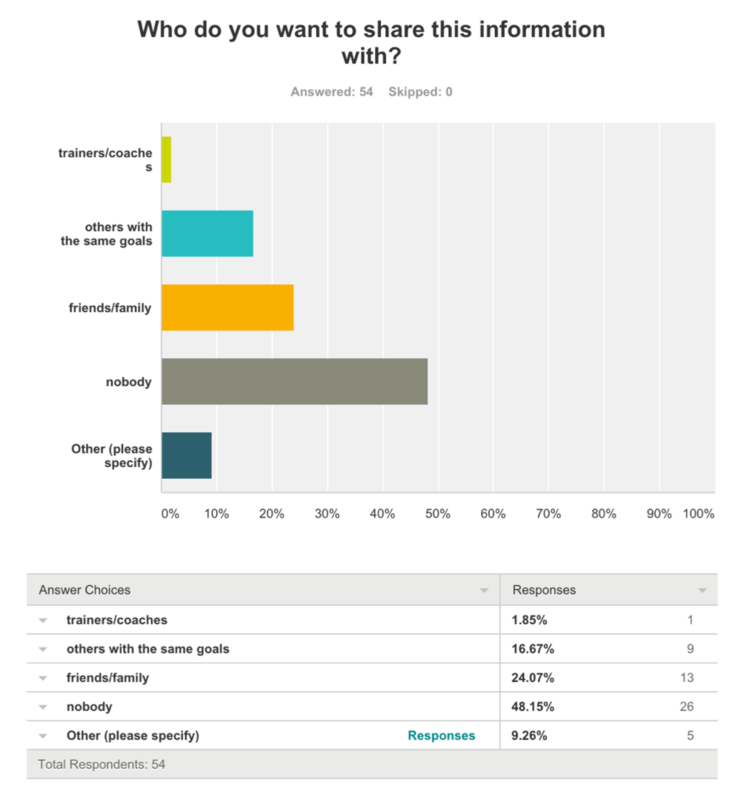 I developed personas based on the data collected from the survey instrument and our intended use cases. Our team collectively created user flows for these personas that demonstrated how each would make use of either a desktop web portal and iOS app solution. Additionally, a fellow team member developed a sketch/prototype of a future generation wearable for the project. This project presented me with the impetus to join the Apple iOS Developer Program. There were many program features that I became familiar with including i.) what/how to join and maintain an Apple developer account ii.) methods for authenticating devices for development, in this case an iPhone 6 plus iii.) and the use of XCode for iOS and OSX software development. During brief research, I chose to familiarize myself with Swift and develop in the XCode 6 environment. I learn very efficiently and effectively by having the opportunity to experiment in a safe sandbox like environment. This was "sort of" like that, with the added element of time constraint. I moved from no experience to "advanced novice" during the course of this project re: iOS software development. I have continued to learn through further experimentation and look forward to having the opportunity to grow my skillet in the future.